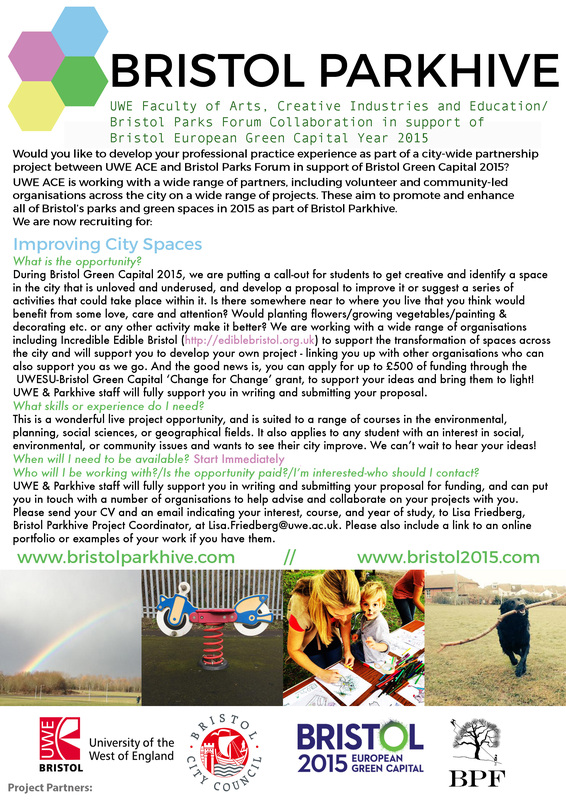 In this Bristol’s Green Capital year, we are putting a call-out for students to get creative and identify a space in the city that is unloved and underused, and develop a proposal to improve it or suggest series of activities that could take place within it. Is there somewhere near to where you live that you think would benefit from some love, care and attention? Would planting flowers/growing vegetables/painting & decorating etc. or any other activity make it better? We are working with a wide range of organisations including Incredible Edible Bristol (http://ediblebristol.org.uk) to support the transformation of spaces across the city and will support you to develop your own project - linking you up with other organisations who can also support you as we go. And the good news is, you can apply for up to £500 of funding through the UWESU-Bristol Green Capital ‘Change for Change’ grant to support your ideas and bring them to light! UWE & Parkhive staff will fully support you in writing and submitting your proposal. Suited for: This project is a wonderful live project opportunity, and is suited to a range of courses in the environmental, planning, social sciences, or geographical fields. It also applies to any student with an interest in environmental, social, or community issues and wants to see their city improve. We can’t wait to hear your ideas!